Growing up I don’t ever recall a time that I willingly ate pasta salad. Cold pasta and cold vegetables? No thank you. My taste buds have changed a lot over the years (and after having a baby) and I find myself enjoying so many foods that I once refused to touch. I decided to give pasta salad a try this week for my lunches. Lunch time with Crosby exhausts me daily, so I need a quick and easy lunch. After trying to convince a toddler to eat for half an hour, then picking up all the food I lovingly prepared off of the floor, this mama needs to have a fuss free lunch. 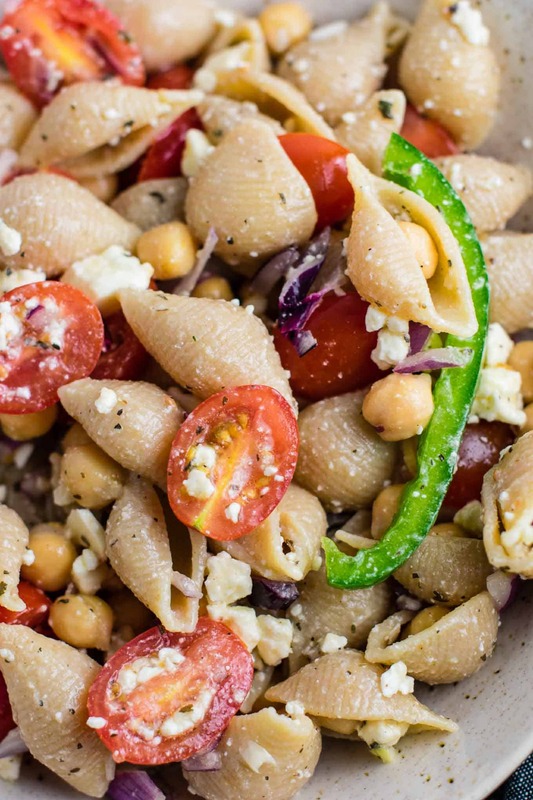 Once Crosby went down for his nap yesterday, I made a big batch of this chickpea pasta salad. 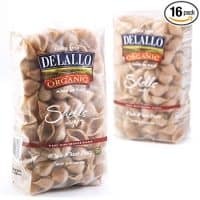 If you follow me on instagram, you might have seen my recent discovery of delallo whole wheat shells. They are LIFE CHANGING you guys. 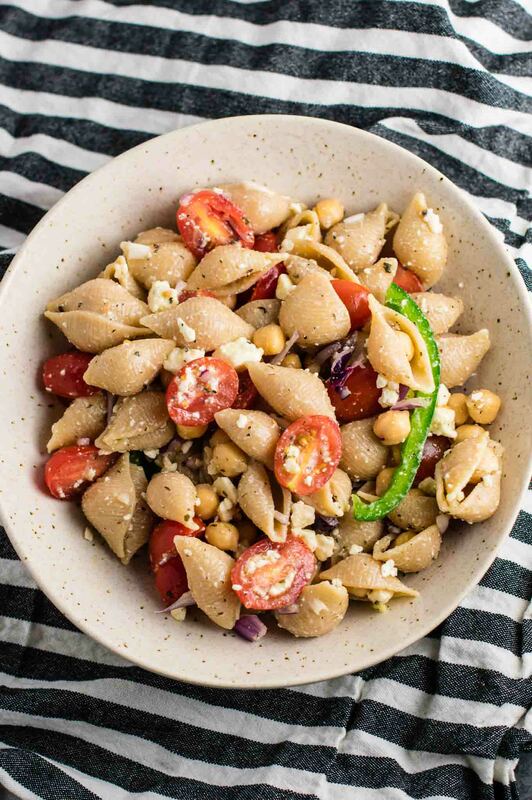 Really, the best whole wheat pasta I have ever tasted. 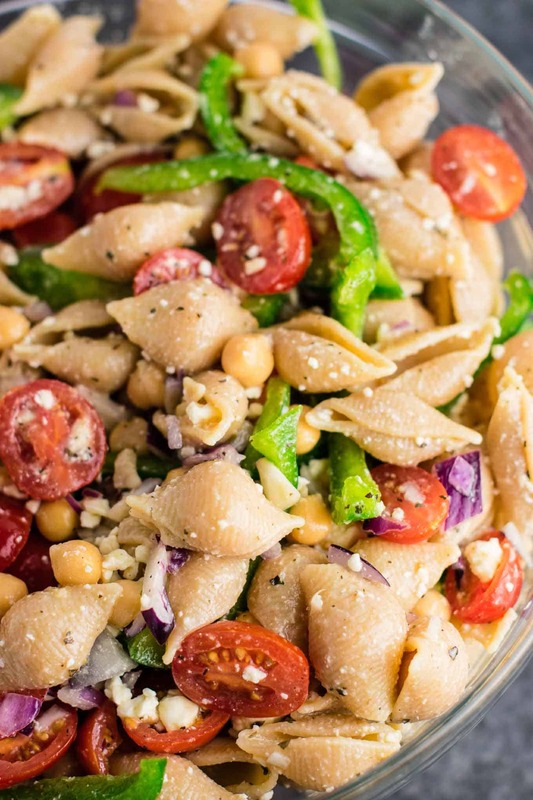 Like most pasta salads, this is best served fresh and will dry out once chilled. If you’re making it for just you, you can easily reduce the quantities. 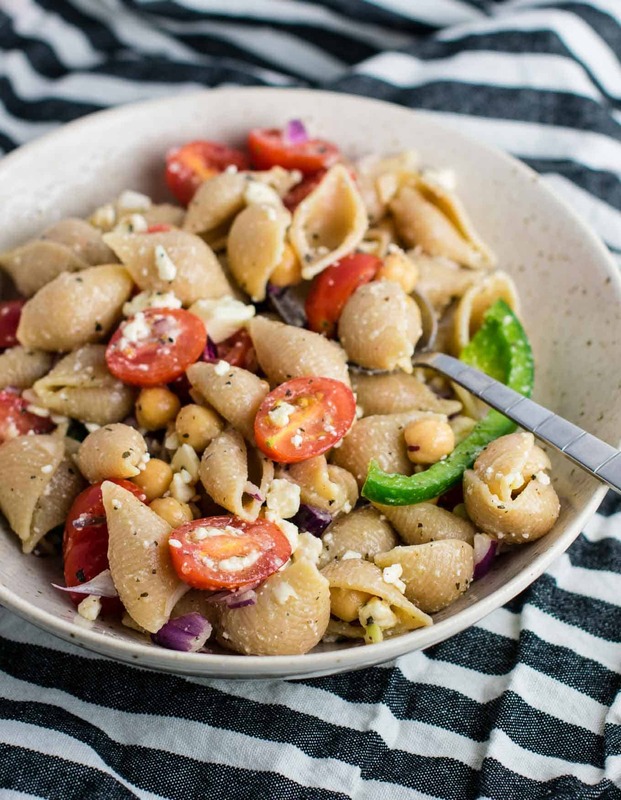 I used those same whole wheat shells for this recipe and loved the way it turned out. 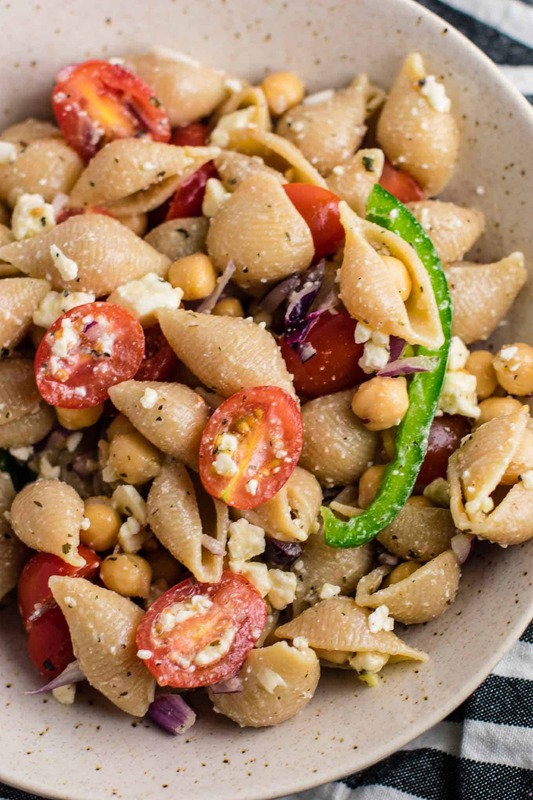 I added in diced red onion, tons of juicy fresh cherry tomatoes, crunchy bell pepper, chickpeas, and the glue that marries all of the flavors – feta cheese. 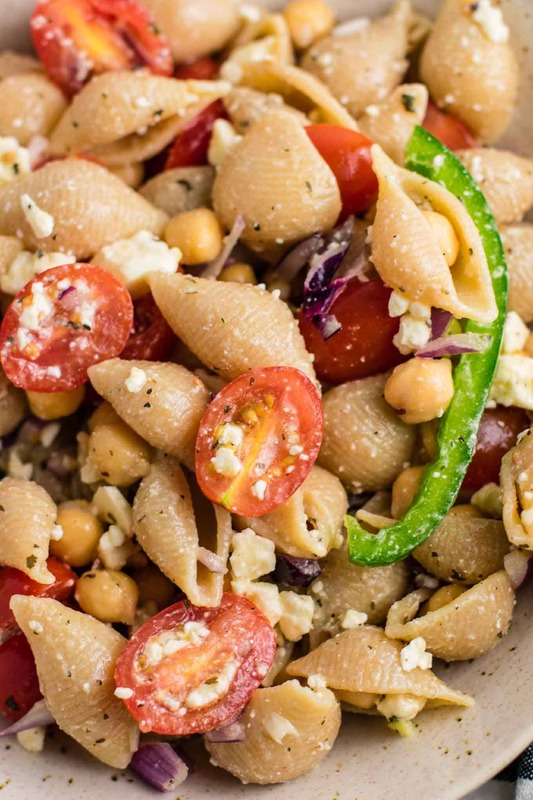 I love feta cheese in salads, and it was perfect in this pasta salad! The dressing is just a simple mixture of fresh lemon juice, olive oil, and a few spices. 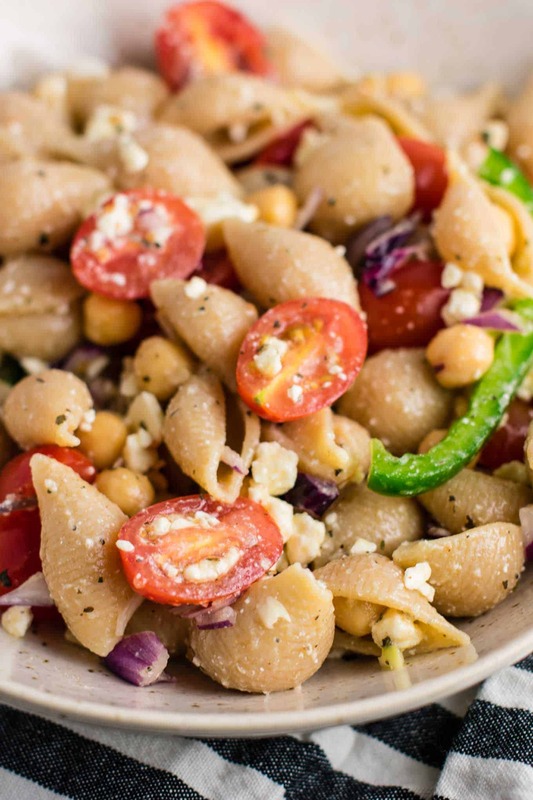 Just shake it together and pour over the pasta salad. 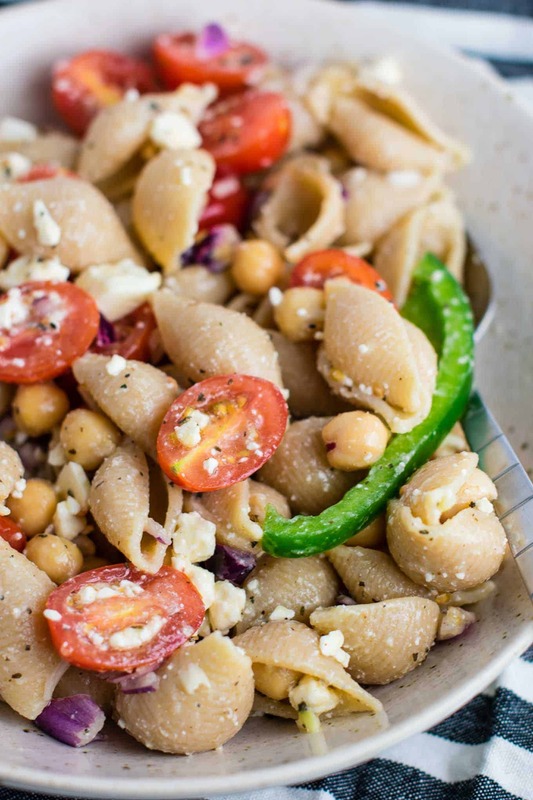 If you want an easy vegetarian dish to bring to a party, this chickpea pasta salad will be a hit! I made this at 10 a.m. and I literally could not stop eating it. I say that in all seriousness! One bite turned into two and I probably ate a whole serving by the time I finished making it! Insanely addicting, full of good for you ingredients, and ready in minutes. If you make this recipe, be sure to tag me on instagram @buildyourbite and hashtag #buildyourbite so I can see! 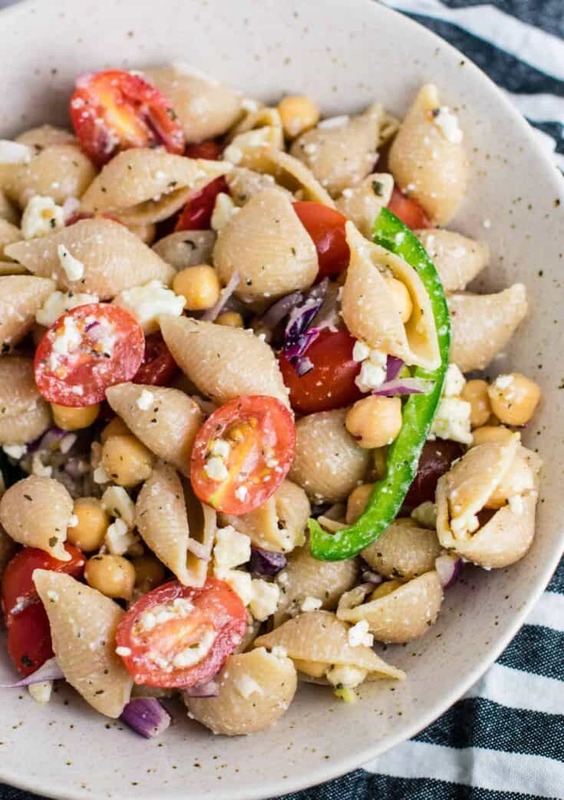 Love chickpea recipes? Here’s some more you may like: Smashed Chickpea Salad Sandwiches, Vegan Chickpea Stir Fry Bowl, Vegan Coconut Curry Bowls.